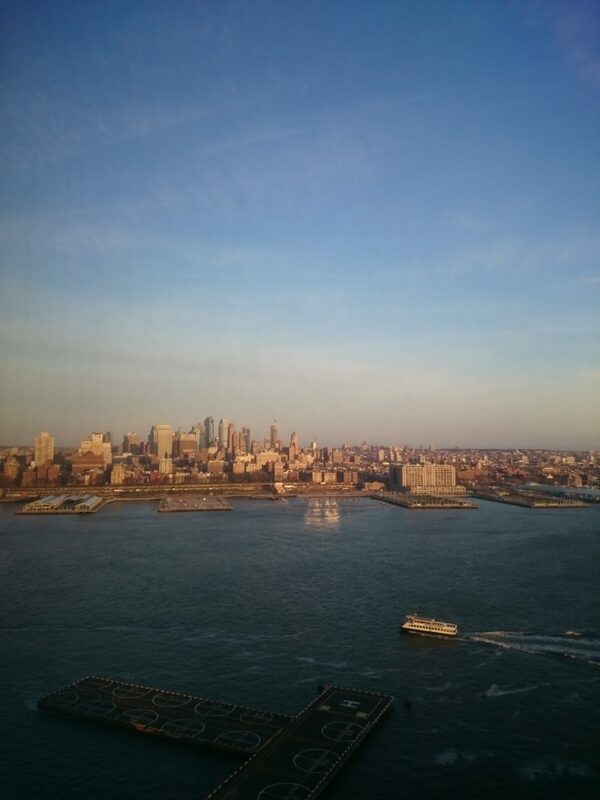 It’s got to be New York, New Yorrkkkk and there is so much gluten free New York to be discovered. During my last couple of work trips to the City That Never Sleeps, I managed to squeeze in some gluten free adventuring. My main takeaway: there are lots of fantastic coeliac-safe gluten free options in NYC, but also numerous”gluten free” offerings that are not coeliac friendly due to cross-contamination risks. Always ask the extra questions when going to a place that isn’t 100% gluten free – people are usually very helpful and it’s better to be safe than sorry. 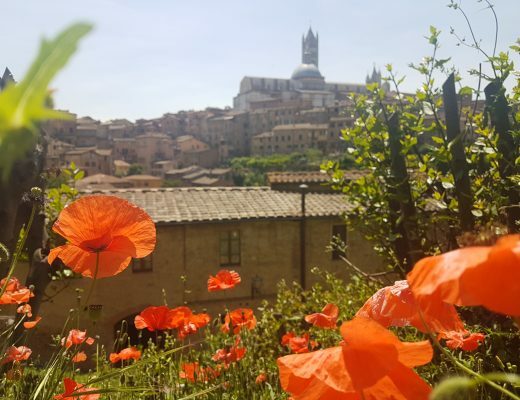 After reading a tonne of enthusiastic gluten free reviews about 100% gluten free restaurant Senza Gluten, I knew it was a must-visit for my latest trip. It’s a lovely little Italian place, which would be perfect for date night but equally I happily ate there solo (the joys of business travel). A portion of bruschetta and large serving of mushroom, speck and truffle oil pasta later, I could wholeheartedly agree with the other recommendations for Senza Glutine. It is a must visit for coeliacs in New York. Another entirely gluten free bakery, this place does the most wonderful gluten free pastries and savoury baked goods. 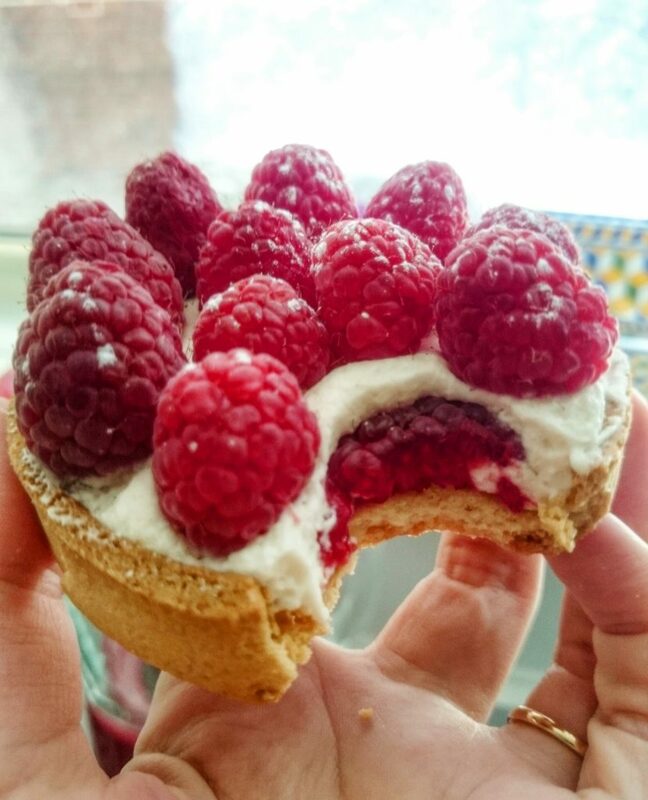 I had the best raspberry vanilla custard tarlet of my life – the sweet pastry was incredible and the filling and fruit made it totally moreish. 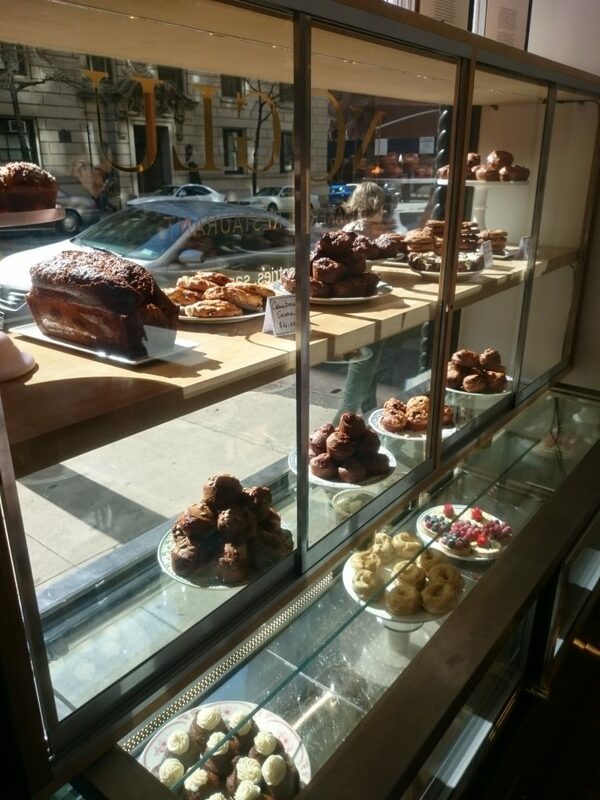 If you only have time to visit one gluten free bakery while in New York, make sure it’s NoGlu. I also sampled their sundried tomato and pesto focaccia bread, which was yummy and survived a New York-London flight! A number of my non-coeliac colleagues recommended Erin McKenna’s bakery to me, as it has quite the reputation. 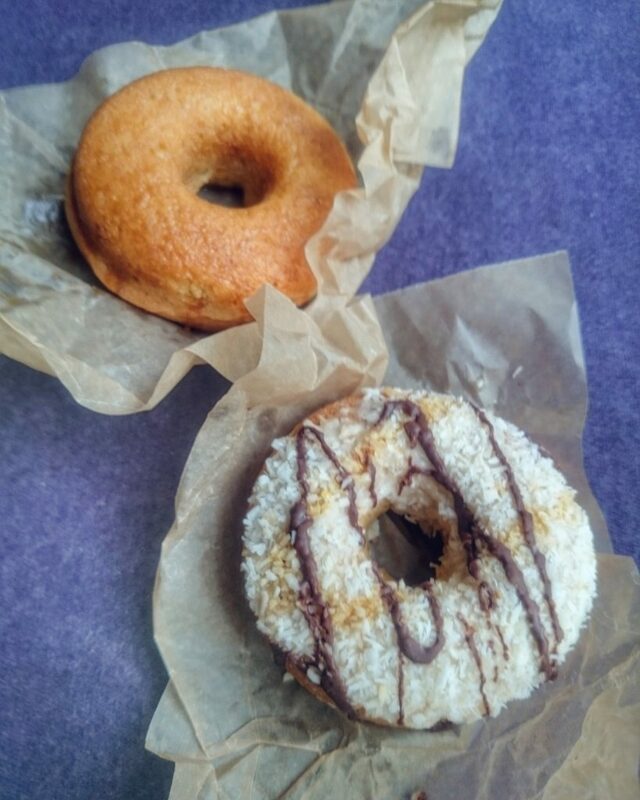 It is a fully gluten free and vegan bakery on Broome Street and I can personally attest that their doughnuts are delicious (salted caramel and Samoa were the flavours I tried…for breakfast one day…what, I was jetlagged!). They have a whole range of baked goods here and the bakery is definitely worth a visit if you are gluten free or coeliac. 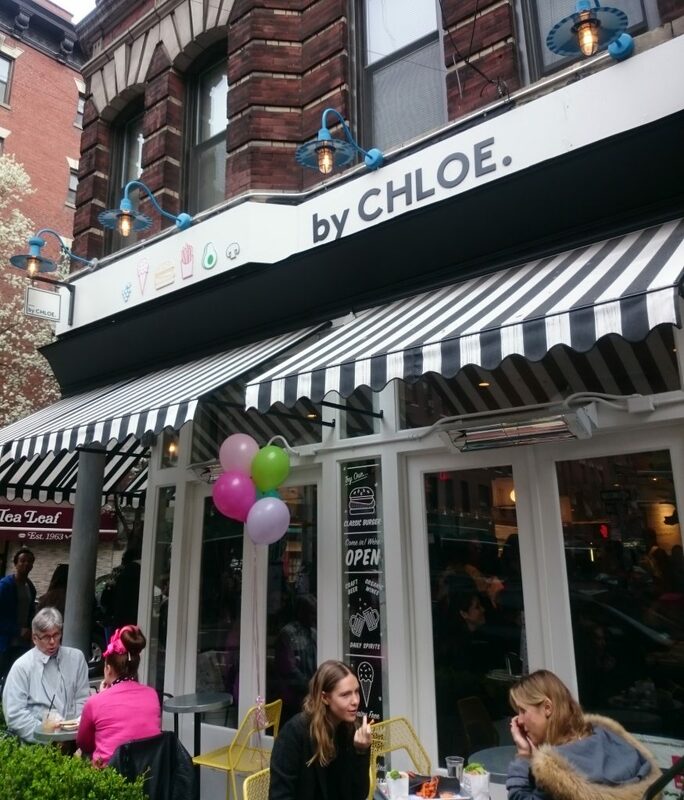 A chain of fully gluten restaurants that looks lovely and has three locations in New York. I haven’t tried it but I have seen a lot of great reviews and their food is fully gluten free. They are also able to accommodate other food allergies here. FINALLY somewhere in NYC where you can get a gluten free, coeliac safe bagel. Modern Bread & Bagel looks amazing and I will definitely be heading here on my next trip to New York. 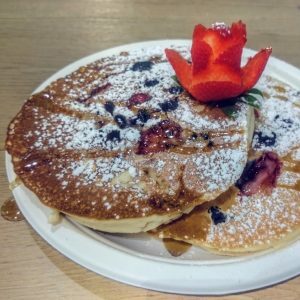 It is a fully gluten free place and in addition to all sorts of amazing bagels they have loads of other great gluten free dishes such as pancakes and french toast. 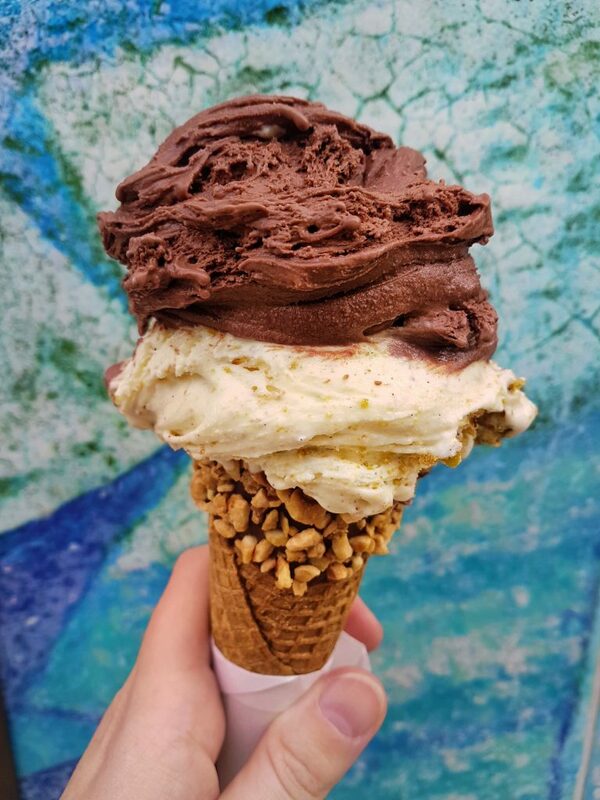 For fully gluten free gelato, including cones and toppings, visit one of the three branches of Grom in New York. This Italian ice cream chain serves delicious gelato and is not one to be missed. A fully gluten free restaurant. 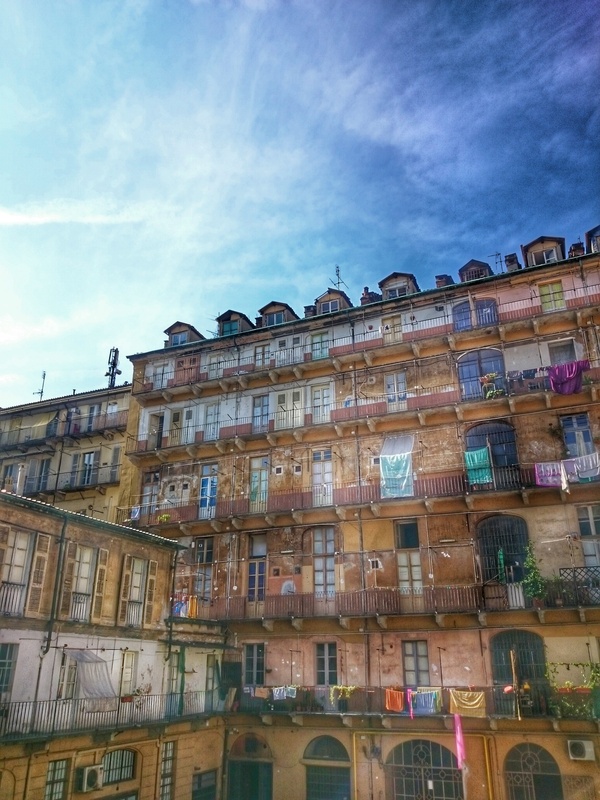 As the name suggests they specialise in risotto and other rice-based dishes. They also have some amazing desserts, such as profiterols and tiramisu. A dedicated gluten free bakery that is a fairly new addition to the gluten free New York scene. They sell cake pops and various other sweet bakes, plus gluten free pretzels at the weekend. They also have some dairy free and vegan choices. Fully gluten-free, with a focus on vegetarian food. They have lots of dairy free options too. A dedicated gluten free bakery for sweet treats that are both gluten free and dairy free. Over in Brooklyn is this fully gluten free Mexican restaurant. The menu here sounds lovely – cool innovative dishes with a focus on homemade, locally-sourced food. A 100% gluten free sushi joint – amazing! The Greenwich Village location of Springbone is totally gluten free and they are strict about ensuring all food stays this way. I’m not sure if their other location is gluten free two but both specialise in bone broth and other healthy dishes. A fully gluten free bakery across the river in Long Island City. The prettiest macarons you ever did see, at this fully gluten free bakery. They sell other gluten free baked goods too, plus their signature “Mookies” – a cookie stuffed with a macaron. Opening in early 2019 is a new Israeli fully gluten free restaurant. 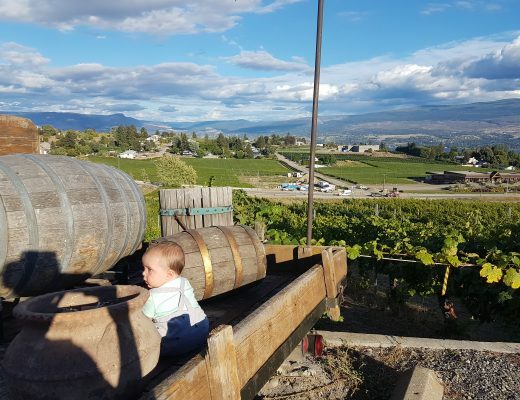 The focus is on artisan, natural food and it is also all kosher. Due to open in April 2019 is this fully gluten free bakery. 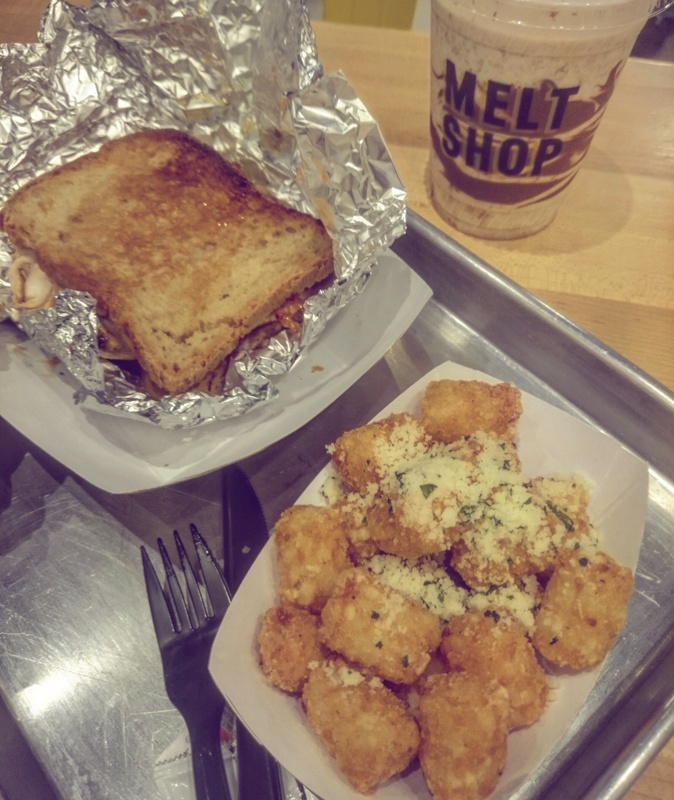 I chanced across Melt Shop while on the hunt for a late evening snack. My tentative questioning about gluten free options was rewarded by a super friendly server who explained that they had gluten free bread available for toasties and they could toast them in foil so as to avoid cross-contamination. PLUS, their Shop Tots (mini hash browns) are gluten free and cooked in a dedicated fryer so I could have those too. Brilliant! I had a gluten free grilled chicken, sundried tomato, truffle mayo and cheese toastie with a side of Shop Tots and a nutella milkshake…my eyes were bigger than my stomach and I was defeated by the generous portions, but it was great to try their various gluten free dishes. The star of the show here really was the staff – they were fantastic and took extra care once I told them I was coeliac and took the time to run me through their gluten free processes. 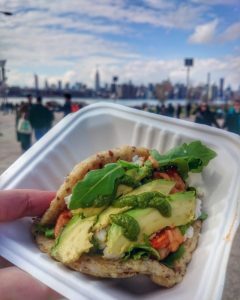 Take a stroll across the river to Williamsburg – it’s a cool area with markets to explore, including the Smorgasburg food market. 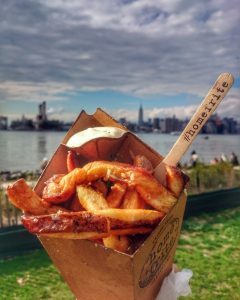 There were a number of gluten free food choices, including epic truffle parmesan hand cut chips with roasted garlic and lemon aioli (drooooool) from Home Frite – I checked with them about whether their food is coeliac friendly and they confirmed they don’t use any wheaty coating on their fries. To go with my fries, I had a quinoa arepa with jumbo shrimp and avocado from Palenque. A New York institution for pizza, Keste also does a mean gluten free pizza with a soft chewy base and crispy crusts. Awesome pizza that is well worth the queue, or you can also order takeaway/delivery if you’d prefer. Brunch it up at Bluestone Lane, an Australian brunch spot that has lovely gluten free bread and plenty of coeliac friendly options. Their gluten free avotoast is all the yumssss. Their corn tortillas are gluten free (avoid the tortilla chips or anything deep fried) and the fillings are awesome. The shrimp was my favourite and their guacamole was gooood! Perfect for late night snackage after the East Village nightlife has worked up your appetite. Teeny tiny cutesy gluten free cupcakes are the order of the day at Baked by Melissa, as well as macarons. I visited the Fulton Street branch where the cupcakes can be purchased in pre-sealed packs of 25, so no worrying about gluteny tongs being used on gluten free cakes or cross-contamination. Alternatively, visit their entirely gluten free branch in the city if you want to buy a smaller quantity of cakes. 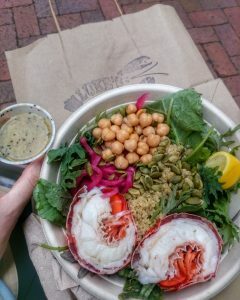 The lobster tail and kale salad here is so fresh and good, plus they also have gluten free bread in case you would rather go for the lobster roll option. There are branches of this chain all over the city – I visited the Fidi branch. A quick pancake hit, Fresh & Co will sort you out. This chain has tonnes of gluten free options – sandwichs and pancakes included. They keep one side of the griddle gluten free and I asked the cook to change his gloves to ensure there was no cross-contamination. I had gluten free buttermilk pancakes with blueberries and strawberries. The famous Dominique Ansel bakery did have some gluten free cakes when I went in, but the gluten free Mini-Me cakes were very friendly with the gluteny eclairs when I went in. As I am coeliac I didn’t want to risk the cross-contamination but if you are just gluten intolerant you may want to check it out. This is a brand sold all over the place in supermarkets across the city (Duane Reade and Wholefoods, for example). 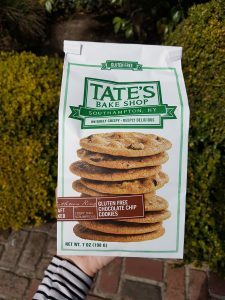 Confession time – I may have developed a mild addiction to Tate’s Bake Shop gluten free chocolate chip cookies. They are AMAZING. Crisp and crunchy and full of chocolate chips. They do great gluten free blondies too, mmmmm. An Indian restaurant with a menu that is nearly all naturally gluten free menu. They have lots of dairy free options too. Three locations across the city. There was a huge queue every time we tried to go here, but they have the gluten free options marked on the menu and a couple of people had recommended this restaurant to me as a coeliac friendly spot. I didn’t manage to get to S’mac on my last trip, there’s only so much food my stomach can handle, but apparently it’s great for gluten free mac n cheese. An upmarket Mexican restaurant where the menu is naturally gluten free. It is usually totally gluten free but by accident, so please check when you visit in case they have any gluten-containing dishes. This restaurant in Chelsea was another recommendation I received. Apparently they have gluten free bread and most of the dishes on the menu are naturally gluten free. Has a gluten free menu. Delicious food and can cater for gluten free. 99% gluten free with a focus on healthy, vegetarian food. Good for lunch bowls. Everything on the menu can be made gluten free and they prepare those dishes in a dedicated part of the kitchen. Very coeliac friendly according to reviews. Italian cuisine including pizza and pasta. Coeliac friendly gluten free pizza available here. For Venezuelan arepas that are all naturally gluten free. Many reviews confirm that this place is safe for coeliacs too. They have two locations in New York. Specialising in tapioca crepes, TAP’s menu is nearly all naturally gluten free. A Mexican restaurant chain that has a gluten free menu and is able to cater for coeliacs. 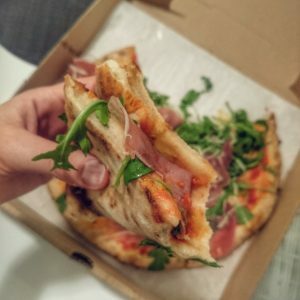 A fancy Italian restaurant that has plenty of gluten free options and strict processes in place to avoid cross contamination.